Adaptive has extensive experience developing world class test equipment and data acquisition systems across many industries. Adaptive’s staff has the skill, knowledge, and experience to work with nearly any test specification. Our expansive test equipment offerings include basic test fixtures, automated test benches, product life-test systems, and complex data acquisition systems. Learn the advantages of working with Adaptive for your test needs. Adaptive Innovations is a premier robotics integrator and automation solutions provider. Our exceptional team of creative engineers combine industry knowledge, process expertise, and outstanding automation experience to provide our clients the equipment necessary to compete in today's global economy. The application of sound engineering principals is the cornerstone of Adaptive’s success. Our trusted team of engineers stand ready to lead or support your ongoing engineering efforts in design, manufacturing, and test. Use Adaptive’s accomplished team as an extension of your engineering resources. Adaptive continuously develops ways to solve tomorrow’s toughest manufacturing challenges today with the application and development of the most advanced technologies available. It is this approach that positions Adaptive as an industry leader and partner of choice for companies looking to rapidly advance their processes. 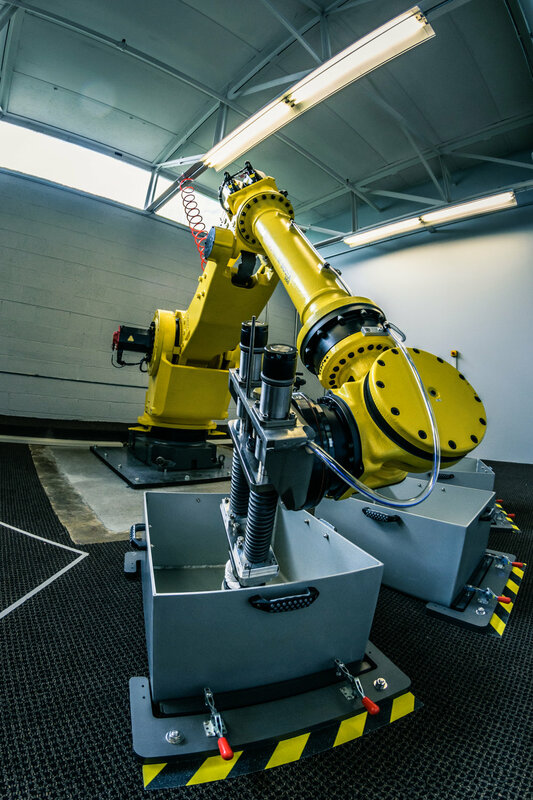 Employing industrial robots, collaborative robots, advanced machine vision, IIOT connectivity and much more, Adaptive has the leading edge knowledge and experience to take your factory to the future. Learn more about some current technologies and how they can be applied to solve your challenges. Seeking an integrator is more than simply finding a company to build a machine. Rather, it is about aligning yourself with an industry partner that largely expands the knowledge base and experience you can draw from. A partner that you can trust and rely on and is invested in your success as a company. One that can accommodate your growing needs and evolving requirements, continuously morphing with the rapid evolution of technology. When evaluating an industry partner, the view is not focused on a single machine, but rather an alignment envisioned to take your company into the future. The benefits of working with Adaptive start with the initial contact and the creative machine solutions generated by our experienced applications team, and extend throughout the life of the partnership. Find comfort in knowing you’re working with a premier solutions provider that aggressively pursues your best interest. Experience our logical, flexible approach to collaborative system development. Recognize the elegance of our user interfaces and the advanced self-recovery programming we routinely implement on our machines. Be confident in our consistent and fair pricing model that insures our customers are receiving the ultimate value. Realize that we only deliver machines that meet or exceed all requirements, and that after delivery Adaptive continues to stand next to our partners to insure long-term satisfaction and success. There are a lot of machine builders out there, but there are only a handful of true partners. Adaptive holds its partnerships at the core of our operational excellence, built on trust, performance and professionalism. Align with Adaptive to experience the Adaptive Advantage today! Our mission is to apply technology and advanced engineering solutions to solve complex manufacturing challenges for our customers. We are committed to providing outstanding quality, exceptional customer service and ongoing support that our customer can always count on. Adaptive consists of a team of professional problem solvers with a passion to develop solutions that drive success in manufacturing. Our team is a close knit group with strong friendships and deep bonds connected through common values. We treat our customers, our colleagues, and our suppliers with respect, honesty and integrity. Our environment is fast moving, highly technical, and constantly changing. An environment in which we encourage creativity, collaboration, and innovation. We take our work and the difficult challenges of being an integrator very seriously; yet we have a lot of fun doing it. We have one of the greatest jobs in the world, working with some of the most advanced technologies available and some of the most forward thinking engineers we have encountered. Success is shared and is the direct result of teamwork. We live, work, and play in beautiful Colorado and the conversations around the water cooler entail stories of outdoor adventures. Our office is dog friendly, keeping the office climate relaxing and on the lighter side of serious.